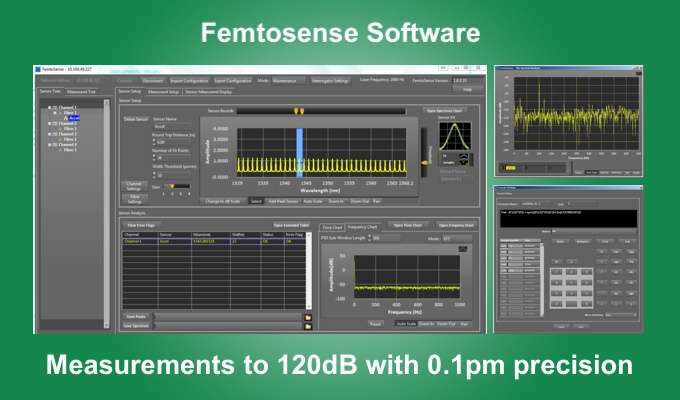 The FAZT FEMTOSENSE configuration software is used for optical sensor setup and measurement. The configuration can be stored inside any instrument that belongs to the FAZT interrogators product family. Once stored in the FAZT interrogators, the respective instruments automatically use that configuration on power up. Designed with versatility in mind, the FEMTOSENSE software is also used for data analysis during optical sensors design, development, manufacturing, and installation. 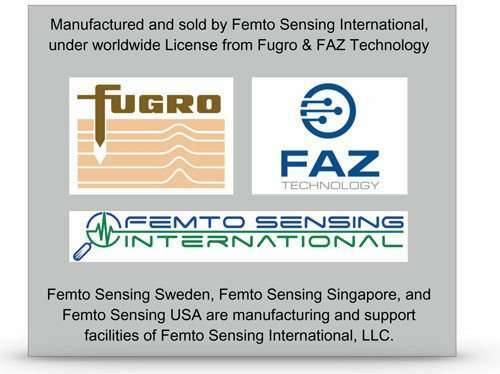 The FEMTOSENSE software is used extensively in conjunction with our family of rugged FAZ Technology interrogators in marine, railways, roads, energy, civil, geotechnical, industrial, security, medical, and many other commercial applications. It is also the software of choice for Research and Development Centers that seek to achieve ultimate precision and repeatability measurements using optical sensing technology. Enables immediate access to ultimate precision, repeatability and accuracy measurements: The FEMTOSENSE software swiftly configures our flagship FAZT I4G interrogator to return measurements in 1pm steps across its wavelength range. Using patented FAZ Technology scan-by-scan calibration, the instrument features ultimate 0.1pm absolute precision, superb repeatability of 50fm max, and absolute accuracy of 1pm (Gas Cell and MZI referenced in closed PM circuit). Ultimate measurements require tight control of all three calibration parameters: precision, accuracy and repeatability. 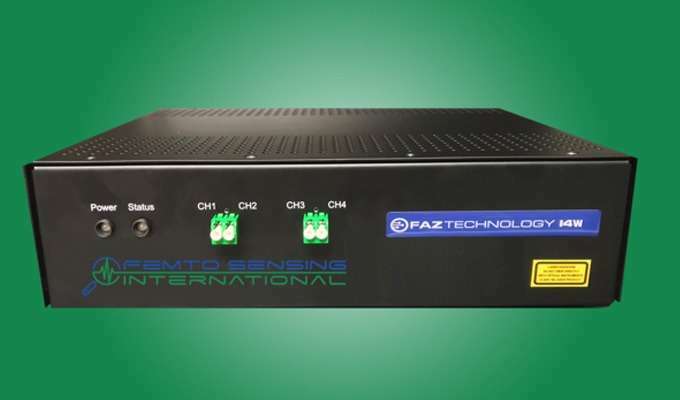 Adaptive to more types of sensors: The FAZT FEMTOSENSE software offers access to the complete range of configuration options for the entire family of available FAZT interrogators. It offers system integrators full flexibility to optimize their sensors and sensors arrays for the specific needs of each application. FEMTOSENSE allows the user to quickly adapt the instrument’s performance parameters to fit many different sensor configurations. 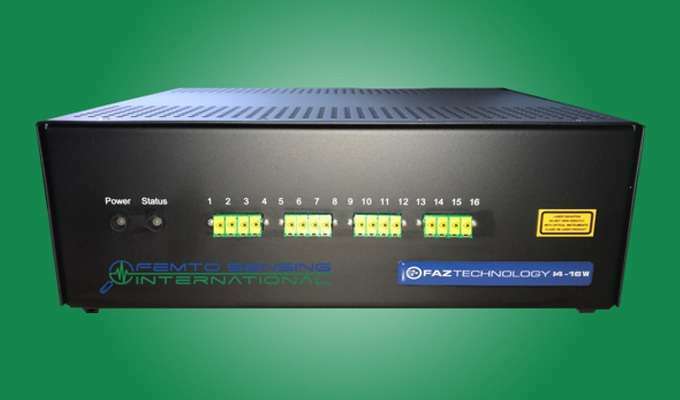 As an example, FEMTOSENSE enables the FAZT I4G interrogator to monitor with ultimate precision more types of sensors than any other instrument, from narrow bandwidth (40-100pm) FBGs used in high-sensitivity accelerometers, pressure sensors, hydrophones, and microphones, to wide bandwidth (1.5nm) FBGs used in bio-sensing. It easily configures peak tracking algorithms for FBG sensors including programmable gain per sensor, sensor width/height thresholds, and distance to sensor settings for accuracy at long distances. Combined with the instruments’ underlying output power (typically ~2 dBm depending on configuration) and high sensitivity receivers, our FEMTOSENSE configured optical sensing systems deliver exceptional optical dynamic range performance over long distances. Field Proven and FREE: The FEMTOSENSE software is used by customers worldwide and comes FREE with each FAZT interrogator. 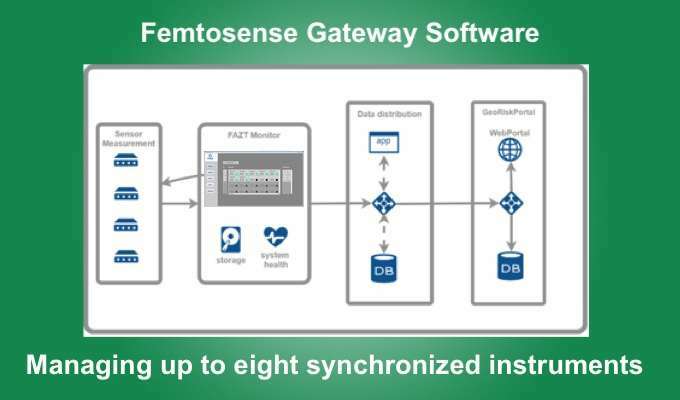 Note 1: The FEMTOSENSE Software enables easy configuration of all FAZT interrogators to also operate under supervisory software systems such as FEMTOSENSE GATEWAY or other software developed by the customer. Supervisory software systems typically monitor and analyze the data for one or more interrogators synchronized to operate in tandem as a system, on site or remotely from a monitoring and control center.